In a world of persistent data growth, companies seek every advantage to manage storage space efficiently and reduce both acquisition and operational costs, all without impacting performance and reliability. However, with common approaches on the market today, we often find ourselves trading characteristics like performance, simplicity or even reliability, in order to save space. In addition to a host of features recently announced in version 3.0, we have added in-line data compression which can be implemented with a simple, non-disruptive upgrade and no additional cost. It is commonly understood that compression and deduplication can come with some impact to storage performance. This is accepted because of the challenges in computational overhead and the fact that data structures are typically defined to limited RAID groups. Typically, more computationally time to manage the data reduction algorithms is needed. This is the main reason why these optimization capabilities are only implemented in all-flash systems. What Makes InfiniBox Compression Different? First, important to note, is that the InfiniBox storage array, by design, is automatically and internally thinly provisioned to allow us a uniquely lighter burden in writing data to persistent media. For instance, the InfiniBox doesn’t physically write zeros. Zeros are automatically reclaimed on write and do not consume physical space. Why waste the time, space and cycles for that when you can clearly track the space that the zeros represent? InfiniBox makes good sense of space efficiency at every level. This capability helps us overall with other storage efficiency capabilities and allows us to provide a highly efficient system, even before compression. INFINIDAT has implemented compression in a completely different way when compared to traditional systems. InfiniBox acknowledges application writes before data is compressed. InfiniBox continues to serve IO at performance levels that typically meet or beat all-flash array performance. InfiniBox does this by not compressing data in our extensive cache layer. The system holds data in cache, uncompressed, serving the ‘hot’ I/Os and maximizing performance before destaging the data to disk where we perform valuable analysis on the data and then compress it. The data remains compressed only at rest (after destaged to persistent media). This means that reads and writes from cache are completely un-impacted by performance. InfiniBox protects and acknowledges it has the data before the data is compressed. When data is actually called from disk (a cache miss), InfiniBox offers advanced distribution and sufficient resources across 3 controllers to effectively minimize the impact of compression and decompressing data into the cache layers (from where it is served). InfiniBox uses three controllers and all their resources to share the workload against the storage. As data is written, it is serialized and sequentialized in large consistent blocks that are evenly distributed across 480 NL-SAS drives, perfectly suitable for sequential reads and writes. InfiniBox has ample CPU, DRAM and Flash Cache to manage even the heaviest perceivable workloads. Our extensive testing has proven that we deliver compression with unperceivable differences in normal client IO workload performance profiles. One of the key differences between the Infinibox array and traditional systems is how we destage data to disk. The destage process InfiniBox uses is done in order to achieve better log writes (sequential) and utilize 30-50GB/s sequential power of our drives. As compressed data is destaged to disk, we serialize and sequentialize the data into large 64K data sections that stripe the data across all the drives in our system. All nodes, and drives participate giving us the absolute fastest read and write behavior in the market to large NL-SAS drives. In addition, the large data sections are ideally sized to serve compression with the highest efficiency. When all of this is added together, we end up with compression ratios that offer 2X to 16X compression with virtually no perceivable impact on performance. The INFINIDAT solution simplifies control of enabling or disabling compression on the data groups as you see fit. A simplified virtual toggle switch on the components of storage lets you choose to select for targeted compression, and visualizing the benefit of compression has never been so simple. In the InfiniBox dashboard, storage pools, volumes and file systems conveniently display the effective compression ratios of data on persistent media and give you complete flexibility on whether to compress data or not. Finally, INFINIDAT brings our compression features together with the most advanced storage performance analytics in the world, with the simplest interface on the market today. No other vendor has gone further to ensure that you can continue to serve your clients with all-flash array-like performance and mainframe class reliability. 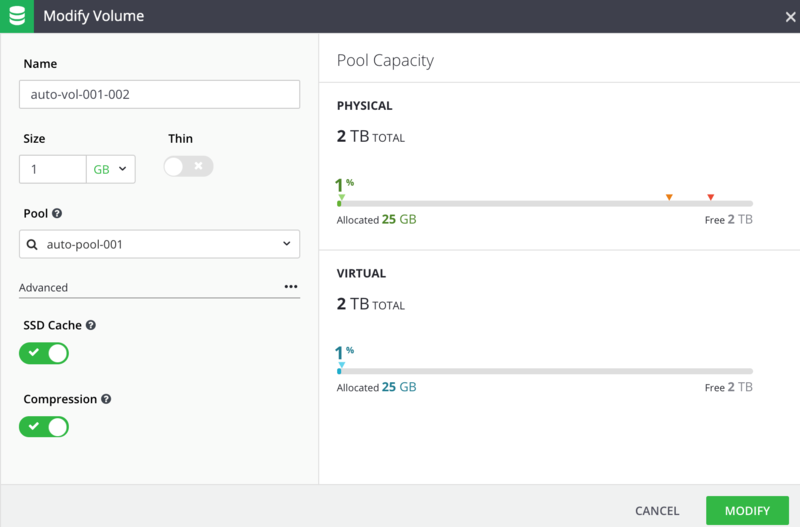 At the same time it’s incredibly simple to deploy and manage while only utilizing 2w/TB of energy, helping to contribute to the finest TCO on the market. During a simple proof of concept, one of our U.S.-based clients ran the numbers and told us that with compression, the cost of INFINIDAT storage is 1/5th the price/TB of their legacy storage (all things considered).